A variety of beads are woven in sections in this 5-wrap design of Chan Luu. Beads include stone, faceted glass, and imitation pearl beads. Chan Luu is a designer of jewelry, accessories, and ready to wear. Originally from Vietnam, she moved to Boston in 1972 and earned a B.A. in Business Administration from Boston University. In 1975, she moved to Los Angeles to pursue her dreams of becoming a fashion designer by receiving a degree in Fashion Design at the Fashion Institute of Design and Merchandising. Shortly thereafter she opened her own boutique located in Rolling Hills Estates, carrying European designer clothing and accessories for women. In 1996, she began designing her own accessories marking the start of Chan Luu, Inc. Chan Luu's trademark is her artistic skill in combining organic shapes with contemporary ideas to create a line that's unique, wearable, and hand-made. 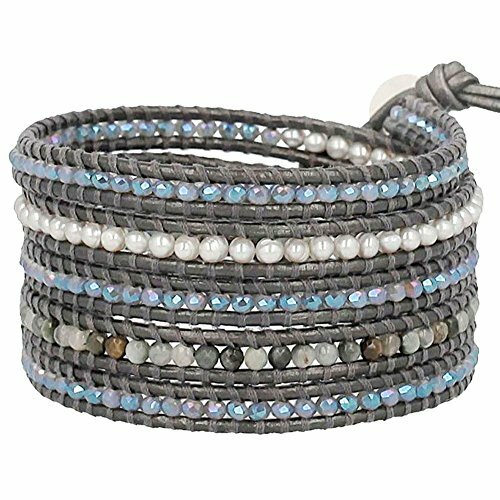 Known for her beautiful wrap bracelets, Chan continues to be a trend leader in fashion today. Her pieces have been featured in the top fashion magazines and have adorned Hollywood's hottest celebrities. Whether your style is modern/bohemian, or simple and classic, Chan Luu jewelry gives you the perfect tools to style your own fashion canvas.